There are so many kitchen tools and pots in the kitchen, so we need an utilitarian appliance to place them. Certainly, you can put them in the kitchen cabinet or the countertop, but isn't there a better way? Why not use a wall pot rack? Pot racks serve three main purposes at the same time. 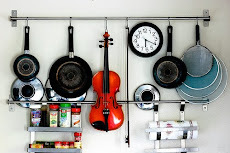 They are decorative, add much needed space and keep your pots and pans at arms reach. These little details help make the difference between a boring and non-personalized kitchen as compared to an organized and comfortable looking kitchen. 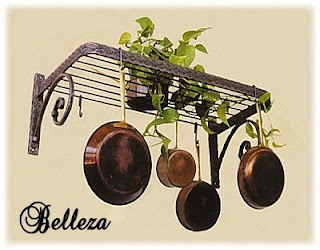 A pot rack can be made of wood, brass, chrome, copper, or wrought iron and can be obtained in a variety of designs, shapes, and sizes.It is very important that a pot rack is mounted properly. Some racks, such as those made of wrought iron, are very heavy themselves. After arranging the cookware, there will be added weight, so care must be taken to see that the wall or the ceiling, as well as the pot rack, are able to support the weight. Hanging pot racks are generally placed over kitchen islands or peninsulas, while wall pot racks are ideally positioned below cabinets or between two cabinets. Heavy, lighted pot racks are rarely chosen; because of their weight, they are hung from a fan brass that is affixed to the ceiling. Based on the requirements and space availability, a homeowner can choose a design that is both attractive and efficient. You can purchase pot racks that compliment your existing kitchen colors, or you can make a statement with highly contrasting finishes. You could also consider mixing the finishes for a more stunning dramatic effect. The importance of a kitchen sink is really beyond question. We use kitchen sink to wash vegetable, fruit, and dishes every day.With the development of technology, people purse the quality of life more than ever before. The kitchen faucet and kitchen sink as the kitchen parts, they need to be looked fashion and usable. 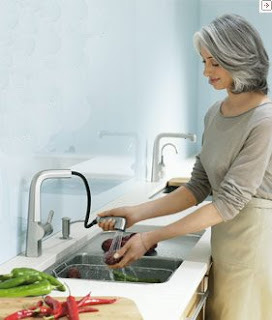 Ever time after we wash the vegetable, we want it be drained as soon as possible. 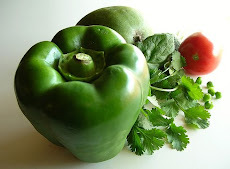 Once upon a time, we usually use a plastic or a stainless steel basket alone to drain the washed vegetable. But now, you only needto buy a kitchen sink that with a drain board. At the same time, there are usually a cutting board with the kitchen sink. 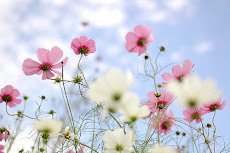 So the process become an easy ride. You complete the washing, draining,cutting in one worktop. Is it more convenient?